The universe is a big place, and it’s hard to fathom the immense size given our finite ideas of distance here on Earth. Because of this, determining an answer for exactly “how big” is difficult. Attempting to figure out the universe’s immense size does involve a few key factors, however. One is understanding a few key facts about how space behaves while also realizing that what we see is just the “observable universe.” We may not actually truly know the true size of the actual universe because, quite frankly, we just can’t see it. So, what’s beyond the observable universe remains a mystery, thus opening up entirely new questions as to what’s beyond our field of view — which also happens to be the subject of many astrophysicist’s researches. Here, we’re going to try to break it down in simple terms to attempt to parse out what is actually one of science’s most complex questions. But first, some basics about how we measure distance in space. The easiest way to measure distance in space is by using light. However, due to the way light travels, you may not realize that when you look to the heavens what you see is not actually how that object actually looks right now in space. Instead, it’s literally taken years, centuries — even eons — for light from those distant object to make it to Earth. Light travels at a speed of 186,000 miles per second, however for such vast distances of space, the second is not a great measurement method. Astronomers use the light-year instead to talk distance. A single light-year is equivalent to about six trillion miles and it not only gives an idea of distance, but the amount of time it takes for light from the object to reach you. On a much smaller scale, we apply this to our own sun. 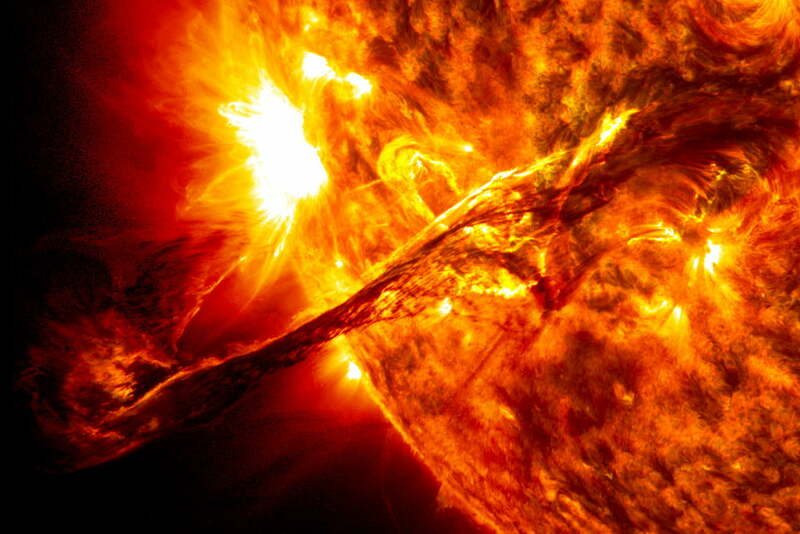 On average, the Sun is about 93 million miles away. If you had the right telescope (and eyewear) to view our sun, you’re actually seeing the way it looked eight minutes ago. Proxima Centauri? That light is from four years ago. And while Betelgeuse is expected to go supernova soon, if it did today, we wouldn’t know until the middle of the 27th century — no joke. Telescopes are merely a part of figuring out cosmic distance, and things become more complex as we aim to measure objects further and further out. Radio telescopes do well for initial observations inside our solar system to measure distance, offering fairly pretty precise results, but once you move out of our solar system, radio telescopes just aren’t practical. Because of this, astronomers now turn to something called parallax. An easy way to understand parallax is by using your own eyes. Take a look at an object by covering one eye and then cover the opposite eye. Did you see the object “move?” This shift is called parallax and it’s usable to calculate a distance. The system works well for our closest celestial neighbors but once you move past roughly 100 light years, the shift is so imperceptible that another method is needed. This next method is something called main sequence fitting and it relies on our knowledge of how stars of a certain size change over time. It looks at the brightness and color of stars further out and compares them with closer stars to attempt to measure its distance. But again, this too has limits, and will only work for stars in our own galaxy or those roughly 100,000 light years away. To go even further out, astronomers rely on a method known as Cepheid variables. Based on Henrietta Swan Leavitt’s 1908 discovery which dictates that a certain type of star varies its brightness over time. These variations — either fast or slow — relate to how bright they are. With this in mind, astronomers have been able to use the main sequence fitting concept to estimate distances — some as far as even 10 million light years away. But we’re still nowhere near where we need to be in order to figure out the vast distances of our universe. For that, we finally turn to a concept known as redshift which imparts us with the necessary range to measure the size of our universe. Redshift is very similar to the way the Doppler Effect works. Imagine you’re sitting at a railroad crossing. Did you ever notice how a train’s horn seems to change in pitch, increasing at it gets closer and decreasing as it gets further away? Light works in a similar way. Look at a spectrograph and take notice of its dark lines. 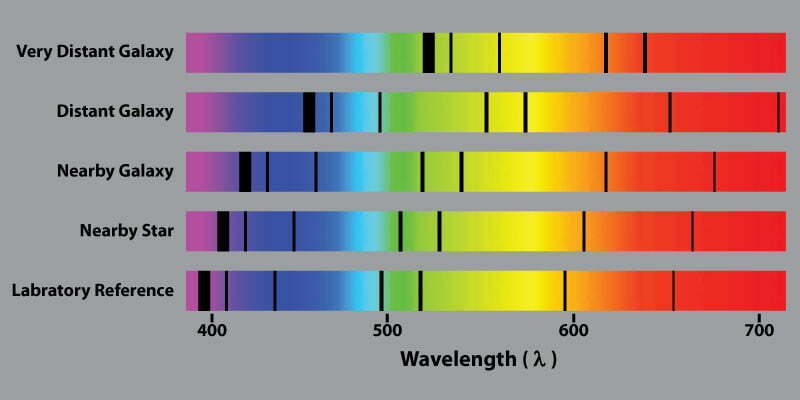 This is caused by color being absorbed by elements in and around the light source. The more these lines are shifted to the red portions of the spectrum — thus the term — the further away the object is. It also is an indication of how fast the object is moving away from us. It is here where we finally get our answer. The most redshifted light is coming from galaxies that are roughly 13.8 billion years old. While it might be easy to think the edge of our observable universe is only 13.8 billion light years in radius from Earth, you’re missing an important part of the story. During those 13.8 billion years, the universe has continued to expand following the Big Bang. What this means is that the actual size of our universe is much, much larger than our initial measurement. Figuring this out takes other research into account, including what we know about how fast the universe has expanded since the Big Bang. Physicists have done just this and now believe the radius of the observable universe is now roughly 46.5 billion light years away. However, it’s also worth mentioning our calculations are based on what’s actually visible and seen. The most distant galaxies in our universe are too well formed to have just appeared directly after the Big Bang, which creates an entirely new conundrum. This yet unexplainable issue opens up a whole new set of problems. Some have attempted to extrapolate how long it took for those too-well-formed distant galaxies to develop, such as researchers at Oxford University in the United Kingdom who estimated the whole universe might be as big as 250 times the size of our observable universe. Try to wrap your head around that. However, some believe in an even crazier theory which would suggest our universe might be one of an infinite number of other universes — this is known as a multiverse. That topic in and of itself would require an entirely different article if we even wanted to try and scratch the surface surrounding the basic principles pertaining to the theory. So, while we can measure the limits of the observable universe, we have no idea what’s beyond it. Of course, that doesn’t mean scientists aren’t trying to figure it out. In other words? We can only guess how big the universe is and scientists may never have an exact answer because of all the possible factors at play.